Normally, I don’t bother to discuss paleoclimatological reconstructions. The reason: most try, some through questionable methods, to illustrate that the recent warming is unusual and could only be explained by the increased emissions of manmade greenhouse gases. And that’s the same claim being made for the instrument temperature record by proponents of the hypothesis of human-induced global warming. But as I’ve been illustrating and discussing for 4 years, ocean heat content data and satellite-era sea surface temperature indicate Mother Nature is responsible for the warming of the global oceans, see here [42MB], so I don’t find claims of unprecedented, human-induced global warming to be realistic. However, I noticed something that’s very obvious in an illustration from a recent paper that’s getting some press, and I wanted to make it easier to see, for those who’ve overlooked it. 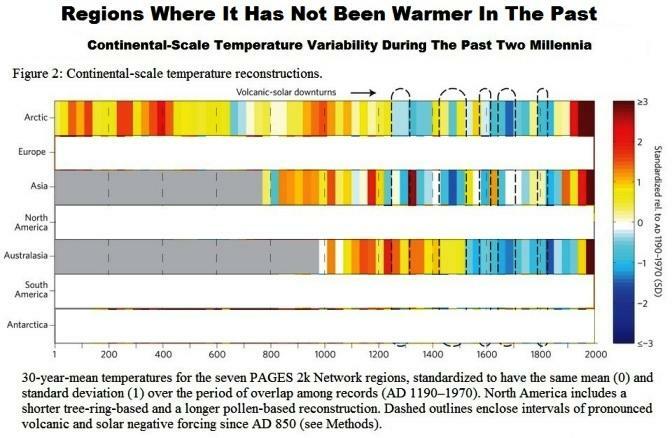 There have been numerous discussions about the Kaufman et al (2013) paper “Continental-scale temperature variability during the past two millennia”, also known as the PAGES (PAst Global changES) reconstruction. ClimateAudit has been reporting on it for a number of days. See Steve McIntyre’s posts here, here and especially here. WattsUpWithThat has discussed the paper here and here. SkepticalScience responded to the paper as could be expected here. 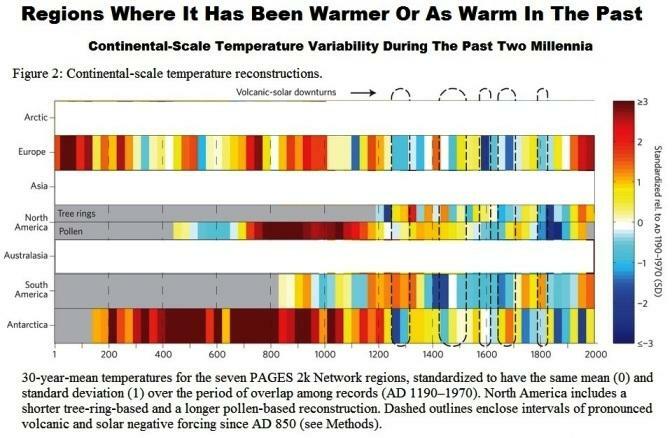 RealClimate’s post includes an interesting illustration, which drew my attention to the paper. It’s a modified version of Figure 2 from Kaufman et al (2013). I’ve included the original version from the paper as my Figure 1. The source of the illustration is here. 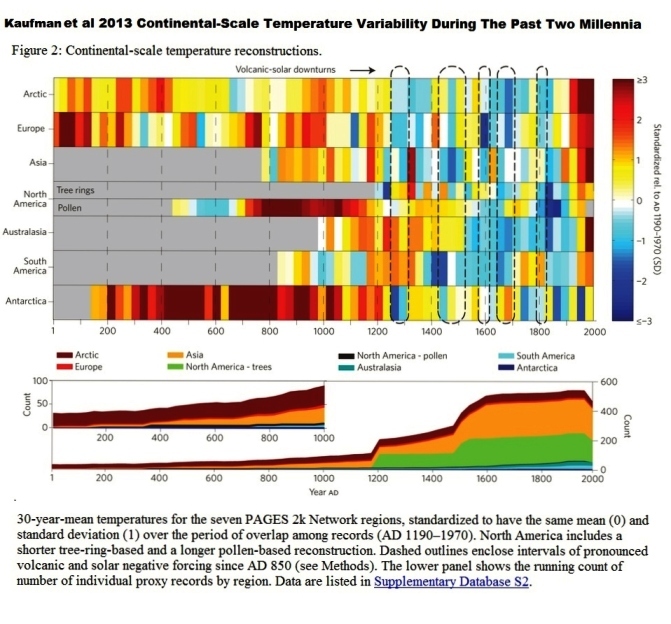 The illustration presents their color-coded temperature anomaly reconstruction as 30-year mean temperature anomalies for the individual regions, which are further identified in the map (Figure 1) from the Kaufman et al (2013). Clearly, there has been, as the title of the paper states, “Continental-scale temperature variability during the past two millenia”. In some of the regions, recent temperatures are warmer than they have been in the past, but in others, the recent temperatures have been exceeded in the past or are comparable. Here, let me make it easier to see. I’ve modified Figure 2 from Kaufman et al (2013) to show only the regions where recent temperatures are warmest in my Figure 2. Those 3 regions include only the Arctic, Asia and Australasia. In my Figure 3, I’ve modified their illustration to show the regions where recent temperatures are cooler than or comparable to past temperatures. Those 4 regions are Europe, North America, South America and Antarctica. Something else also stands out in the 3 regions where current temperatures are warmest, my Figure 2. Only one of the reconstructions extends back the full 2000 years. Would Asia and Australasia have warmer temperatures than those we’ve experienced recently if their reconstructions could be extended farther back in time? Dunno. Clearly, the claims of unprecedented recent temperatures are not supported by the regional reconstructions. Four of the seven regions presented by Kaufman et al (2013) clearly show that recent temperatures are comparable to past temperatures or they have been exceeded in the past. This can also be seen in the individual graphs presented in Steve McIntyre’s post here. Now, hasn’t this been one of the arguments by climate skeptics since the hockey stick was introduced—that the hockey-stick appearance is a regional phenomenon? That regional reconstructions show current temperatures have been exceeded in the past in many parts of the globe? This entry was posted in Paleo Climate. Bookmark the permalink.